Plant biotechnology is a precise process in which scientific techniques are used to develop molecular and cellular based technologies to improve plant productivity, quality and health; to improve the quality of plant products; or to prevent, reduce or eliminate constraints to plant productivity caused by diseases, pest organisms and environmental stresses. It can be defined as human intervention on plant material by means of technological instruments in order to produce permanent effects, and includes genetic engineering and gene manipulation to obtain transgenic plants. Plant genetic engineering is used to produce new inheritable combinations by introducing external DNA to plant material in an unnatural way. The results are genetically modified plants (GMPs) or transgenic plants. The key instrument used in plant biotechnology is the plant tissue culture (PTC) technique which refers to the in vitro culture of protoplasts, cells, tissues and organs. Plant biotechnology in use today relies on advanced technology, which allows plant breeders to make precise genetic changes to impart beneficial traits to plants. The application of biotechnology in agriculture has resulted in benefits to farmers, producers and consumers. Plant biotechnology has helped make both insect pest control and weed management safer and easier while safeguarding plants against disease. The worldwide demand for food, feed and modern textile fibers can only be met in the future with the help of plant biotechnology. It has the potential to open up whole new business areas that will totally redefine the current market scope and perception. This book majorly deals with the organisms of biotechnology, herbicide resistant plants, transgenic plants with improved storage proteins, engineering for preservation of fruits, enhancing the photosynthetic efficiency, basic requirements for nitrogen fixation, animal and plant cell cultures , insecticides, cellular characteristics which influence the choice of cell , the growth of animal and plant cells immobilized within a confining matrix, virus free clones through plant tissue culture , microbial metabolism of carbon dioxide , organisms involved in the conversion of hydrogen, hydrogen utilization by aerobic hydrogen oxidizing bacteria, overproduction of microbial metabolites, regulation of metabolite synthesis etc. The book contains measurement of plant cell growth, plant tissue culture, initiation of embryo genesis in suspension culture, micro propagation in plants, isolation of plant DNA and many more. This is very helpful book for entrepreneurs, consultants, students, institutions, researchers etc. over a small growth time. The reduction of atmospheric nitrogen into ammonia by soil-borne microorganisms is called biological nitrogen fixation. Biological nitrogen fixation was discovered in legumes by wilfrath. The nitrogen fixing bacterium Rhizobium leugminosarum was first isolated from legumes by Beijerinck in 1922. Many bacteria and BGA do nitrogen fixation. The global nitrogen fixation is 175 x 106 tons/year. Nitrogen is on of the major elements useful for plant growth. Our atmosphere contains about 80% gaseous nitrogen but green plants are unable to use it directly from the atmosphere. Some soil bacteria and blue-green algae are capable of reducing the atmospheric nitrogen into ammonia in their cells. The process of nitrogen reduction is called diazotrophy or nitrogen fixation. The enzyme nitrogenase is useful nitrogen fixation. The microbes which reduce nitrogen are called nitrogen fixers of diazotrophs. Ammonia produced during nitrogen fixation is readily available to plants directly. Green plants use ammonia to synthesise nitrogen-containing compounds such as arginine, asparagin, allantonin and allantonic acid. These nitrogen containing compounds synthesised directly from ammonia are known as urides. Urides are involved in the metabolism of nucleic acids and proteins. Diazotrophs are broadly divided into two groups, namely non-symbiotic nitrogen fixers and symbiotic nitrogen fixers. Azotobacter, Clostridium, Azotococcus, Oscillatoria, Cylinderospermum, etc. are non-symbiotic nitrogen fixers. Anabaena, Nostoc, Rhizobium, Azospirillum, etc. are symbiotic nitrogen fixers. Some microorganisms live independently in the soil and do nitrogen fixation. Such microbes are called non-symbiotic nitrogen fixers or non-symbiotic diazotrophs. Nitrogen fixation by these microbes is known as non-symbiotic nitrogen fixation. The free-living autotrophic diazotrophs synthesise their own food either by photosynthesis using the sunlight or by chemicals. Among these diazotrophs, some are aerobes - e.g. Oscillatoria, Cylindrospermum, Plectonema, Tolypotrix, etc. Some others are anaerobes e.g. Chlorobium vibriforme, C.limicola, Chromatium minus, Thiocystis formosa, Rhodopseudomonas viridis, etc. The free-living heterotrophic diazotrophs, on the other hand, use dead organic matter as food and do nitrogen fixation. Examples Clostridium, Azotobacter, Beijerinckia, Klebsiella pneumoniae, etc. All diazotrophs contain the enzyme nitrogenase which catalyses the reduction of N2 into NH3. Nitrogenase is sensitive to oxygen, so it prefers anaerobic conditions for nitrogen fixation. But in microbes, the oxygen level is usually high. The high oxygen level leads to oxidation of nitrogenase and hence that enzyme becomes inactive. Blue green algae are photoautotrophic diazotrophs living on moist soils. They have photosystem-I and II so that oxygen is evolved during the light reaction of photosynthesis. This oxygen may inhibit the nitrogenase activity. In these algae, photosynthesis is restricted to vegetative cells and nitrogen fixation is restricted to heterocysts. Examples Anabaena, Nostoc, Tolypothrix, Cylindrospermum, Aulosira, etc. Heterocysts are thick-walled cells that lack photosystem II. The thick wall of the heterocysts prevents the entry of oxygen into the heterocyst. 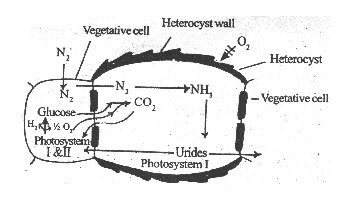 Since photosystem II is absent, oxygen has not been evolved during photosynthesis in the heterocysts. But, respiration is going on continuously. Because of these reasons, partial anaerobic conditions develop in the heterocysts for nitrogen fixation. Heterocysts have various enzymes involving in the anabolism of urides. Fig. 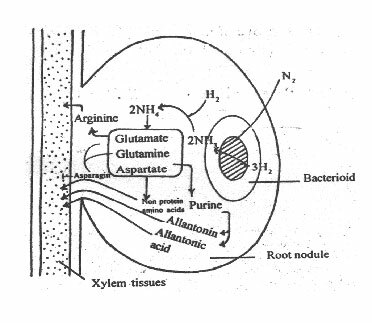 1: Diagram explaining special separation of nitrogenfixing cells and photosynthetic cells. Azotobacter, Derixa and Mycobacterium are aerobic heterotrophic nitrogen fixing bacteria. In these bacteria, some intracellular proteins are found associated with nitrogenase, when oxygen level is high in the cells. When the oxygen level comes down, the proteins release the nitrogenase free. The free nitrogenase fixes nitrogen as usual. Some aerobic heterotrophic diazotrophs show high rate of respiration. So the cellular oxygen level is reduced to certain extent. At the reduced oxygen level, nitrogenase reduces N2 into NH3. Egs. Azotobacter. Rhodopseudomonas capsulata is an aerobic photo autotrophic diazotroph. It does photosynthesis in the daytime and does nitrogen fixation in the night. In the night, oxygen level comes down in the cells due to continuous respiration. Some microbes cannot fix nitrogen when they are living far away from rhizosphere zone of some higher plants. Eg. Klebsiella, Rhodopseudomonas, Chloropseudomonas, etc. When they are living in the rhizosphere of high oxygen consuming plants, they fix the atmospheric nitrogen. Here plant roots create a partial anaerobic condition that favours for nitrogen fixation. When nitrogen not happens to be around, nitrogenase reduces hydrogen ions (H+) into H2. It utilizes reductants and ATP while reducing H+ ions. It is a useless process. Besides this, hydrogen so produced, while reaching higher concentration, inhibits nitrogen reduction. Azotobacter chroococcum and Anabaena cylindrica contain the enzyme hydrogenase. Hydrogenase transfers electrons to high-energy potential electron acceptor and combines Â½O2 and 2H+ into H2O. This process is often called hydrogen uptake. The hydrogenase doing hydrogen uptake is known as uptake hydrogenase or irreversible hydrogenase. Hydrogen uptake reduces the H2 and O2 levels in the nitrogen fixing cells. Further, it supplies ATPs to provide energy for nitrogen reduction and reduces the wastage of reductants. Therefore, nitrogenase is safe in the nitrogen-fixing cell and does nitrogen reduction. The unicellular blue-green alga Cleocapsa forms a globular colony by aggregation of many cells. Outer cells of the colony prevents the entry of oxygen into the inner cells. Hence, the inner cells are slightly anaerobic to do nitrogen fixation. Biological nitrogen fixation is catalysed by the enzyme nitrogenase. Nitrogenase consists of one larger sub-unit and one smaller sub-unit. The larger sub-unit is called molybdenum ferrous protein or nitrogenase reductase. The smaller sub-unit is called ferrous protein. The Mo-Fe protein is 200,000-245,000 daltons in molecular weight. It is made up of two identical identical a-polypeptide chains and two identical small b-polypeptide chains. The a and b chains are bound together by 1-2 Mo atoms, 12-32 Fe atoms and 30 sulphur atoms. An Mo atom is surrounded by 7 ferrous atoms and the ferrous atoms and sulphur atoms are arranged in 4+4 clusters. The ferrous protein, on the other hand, is 60,000 - 60,700 daltons in molecular weight. It consists of two more or less identical polypeptide chains which are held together by 4 ferrous atoms and 4 sulphur atoms. It carries Mg-ATP for nitrogen reduction. The Mo- Fe protein and Fe-protein combine together in the presence of Na+ ions to form an active nitrogenase complex. Fig 2. Components of nitrogenase complex. Nitrogenase requires an energy source and electron donors for nitrogen reduction. ATPs released during the metabolism of carbohydrates, proteins and lipids react with Mg++ ions to form Mg-ATPs. The Mg++ of Mg-ATP binds with a Fe-protein to form an active complex. The Mg-ATP is hydrolysed into Mg-ADP and inorganic phosphate (ip) to supply energy. About 12-15 Mg-ATPs are required to reduce one molecule of N2 into NH3. The electrons required for nitrogen reduction are provided by electron donors or reductants. In many diazotrophs, ferridoxin serves as an electron donor. In Azotobacter and Blue-green algae, NADPH functions as an electron donor. In anaerobic diazotrophs, pyruvate transfers electrons to nitrogenase complex for nitrogen reduction. 1. The Fe-protein (nitrogenase reductase) receive electrons from ferridoxin (or NADPH) and gets reduced. 3. The nitrogenase (no-Fe-protein) accepts a molecule of N2 to gets converted into a nitrogenase nitrogen complex (NNC). Nitrogenase + N2 nitrogenase nitrogen complex. 4. The RFP-MA complex binds with the nitrogenase nitrogen complex to form an active nitrogenase complex in the presence of Na+ ions. Electrons in the RFP-Ma complex is transferred to nitrogenase for reducing the nitrogen. During this electron transfer, some 2H+ ions may be reduced to H2. i)	First, nitrogen (N2) reacts with 2H+ ions by consuming 2 electrons to form a diamide. iii)	The hydrozine reacts with 2H+ ions by consuming 2 eletrons to form 2 molecules of ammonia. Fig. 3: A hypothetical representation of nitrogenase activity in nitrogen fixation: Â¨ indicates oxidized state of the enzyme sub-unit; n indicates reduced state of the enzyme sub-unit. 6. 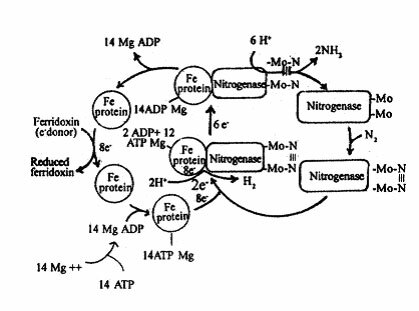 After the reduction of N2 into NH3, the nitrogenase complex dissociates into a Fe-protein, nitrogenase, Mg++ and ADPs. NH3 so produced is released in the cytoplasm. The enzyme is now available to reduce another molecule of nitrogen. Ammonia Produced during nitrogen fixation is unstable at the physiological pHs. So it is readily converted into ammonium (NH4). The ammonium is involved in the biosynthesis of amino acids. Ammonium reacts with one molecule of glutamic acid to form a glutamine molecule. This reaction is catalysed by glutamine synthetase (GS), which has high affinity to NH4. One molecule of ATP is hydrolysed during this reaction. 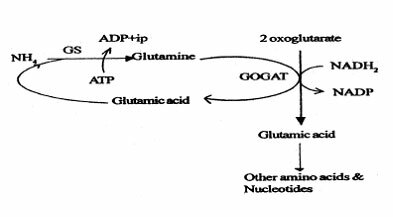 The glutamine reacts with a molecule of 2 oxoglutarate in the presence of NADPH2 to form 2 molecules of glutamic acid. This reaction is catalysed by glutamine oxoglutarate aminotransferase (GOGAT). Of these two glutamic acid molecules, one goes to reacts with another NH4 molecule and the other is used to synthesise other amino acids and nucleotides. Fig. 4: A pathway of ammonium assimilation in non-symbiotic nitrogen fixers. 2-oxoglutarate reacts with NH4 and NADH or NADPH, and undergoes reductive amination to form a glutamic acid molecule. This reaction is catalysed by the enzyme glutamate dehydrogenase (GDH), which has lesser affinity to NH4 than glutamine synthetase. So the speed of NH4 assimilation in this route is somewhat slow. Some microorganisms establish symbiotic association with plant roots and do nitrogen fixation. Such microbes are called symbiotic nitrogen fixers or symbiotic diazotrophs. The diszotrophs derive nourishments from the plant roots and provide nitrogen to it. Nitrogen reduction by symbiotic microbes is called symbiotic nitrogen fixation. During symbiotic association, some diazotrophs induce nodule development on the plant roots. This type of symbiosis is called rhizocoenosis. Eg. Rhizobium, Frankia, etc. Here nitrogen fixation takes place in the root nodules. Rhizobia establish symbiotic association with roots of legumes and form root nodules. Rarely, they induce nodulation in the roots of non-legumes such as Trema canabaena. Frankia induces root nodulation in Alnus, Casuarina, Myrica, Discaria, etc. Some symbiotic diazotrophs do not form root nodules in host plants. E.gs- Azospirillum, Beijerinckia, Azotobacter paspali, etc. Azospirillum sps. are found associated with roots of many monocot and dicot plants. Beijerinckia is seen on the roots of sugarcane. Azotobacter paspali is seen on the roots of paspalum notatum, wheat, corn, sorghum, etc. Symbiotic diazotrophs cannot fix the atmospheric nitrogen, when they are living alone in the soil. But certain yanabacteria, are fixing nitrogen both when they are residing in the host and when they alive free in the soil. Examples Nostoc, Anabaena, etc. Rhizobium leguminosarum establishes root nodules in pea. Rhizobium phaseoli induces nodulation on roots or beans. Rhizobium japonicum forms root nodules in soyabean.. The host specific infection of Rhizobium depends upon the specific flavonoid secreted by the roots of legumes. Alfalfa exude luteolin an white clover exude dihydroxyflavone along with lectins. The root exudate induces certain genes of a particular species or Rhizobium to produce a host determinant compound on its cell wall. In most cases, the host determinant compound is a capsular polysaccharide (CP). 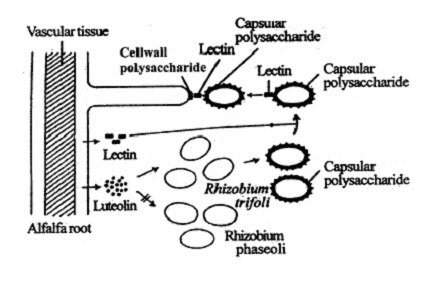 The lectin produced by the legume root has affinity to the capsular polysaccharide. Therefore, it binds with the capsular polysaccharide of the specific Rhizobium species and the other end of the lectin binds with cell wall polysaccharide of a hoot hair. Here, lectin acts as a bridge molecule. After recognition, the Rhizobium infect the root hair. Fig. 5. Mechanism of host specific infection of Rhizobium trifoli on the root hair of alfalfa. 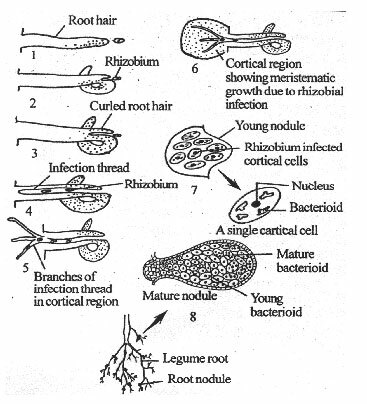 The formation of root nodules after the roots get infected with Rhizobium is called nodulation. The protein lectin (phytoaglutinin) helps for host specific binding of Rhizobium on the root hair. The Rhizobium secretes cytokinin and polymixin-B, which induce curling of the tip of the root hair. Cell wall of the root hair, at the point of contact, invaginates and forms a tubular structure called infection thread. Rhizobium enters the infection thread. The infection thread grows continuously and penetrates the cortical cells of the plant root. It branches repeatedly and forms a fungal hypha-like infection thread. As the infection thread grows, the Rhizobium reaches the cortical region. Fig. 6: Root nodulation in legume. The cortical cells near endodermis get penetrated by the infection thread. Rhizobium releases some growth hormones to the cortical cells. Hence the inner cortical cells around the infection thread divide and grow faster to form a mass of cells. In these cortical cells the chromosome number may get doubled. By continuous growth, the mass of cells protrudes from the surface of the root, in the form of a nodule. Rhizobium multiplies within the infection thread as well as in the cortical cells in which they were discharged. As a result, the central portion of the nodule is occupied by a dense mass of Rhizobia. Each cortical cell has 4-6 pleomorphic Rhizobia called bacterioids. They may be club-shaped, Y-shaped or branched. The membrane of the cortical cell enclosing the bacterioids is known as peribacterioid membrane. The bacterioids fix the atmospheric nitrogen into ammonia. called nodulins. The nodulins help to maintain the structure of root nodules, to support the nitrogen fixation and to assimilate the fixed nitrogen in the nodules. Environmental factors like high dose of nitrogen fertilizers, low concentration of CO2 and dense population of other species of bacteria in the rhizosphere decrease the nodulation. The temperature between 25-300C favours for nodulation. High light intensity and high concentration of CO2 are found to be not suitable for nodulation. Rhizobium is a symbiotic, aerobic nitrogen fixer. It cannot fix nitrogen when it is free living. Nitrogen fixation is catalysed by nitrogenase which is sensitive to oxygen. It gets inactivated when the oxygen level exceeds 0.5 atm. In plant cells, oxygen level is some what high, so the nitrogenase may fail to reduced the nitrogen. Leghaemoglobin (LHb) is a red, myoglobin-like protein present only in healthy root nodules of legumes. It is encoded by certain genes of the legumes. It is found outside the bacterioid, but in close contact with it. Leghaemoglobin has a haem prosthetic group so that it acts as haemoglobin in blood. It has affinity to oxygen. It acts as an oxygen carrier within the root nodule. Leghaemoglobin combines with oxygen to form oxyleghaemoglobin and provides the oxygen to plant cells for respiration. So the oxygen level around the bacterioid is reduced to a great extent. Further, it supplies low level of oxygen that does not affect nitrogenase activity to the bacterioid for its respiration. Thus leghaemoglobin acts as a buffering system. Besides this, leghaemoglobin supplies O2 to terminal oxidation process to generate ATPs for nitrogenase activity. Some strains of Rhizobia contain hydrogenase, the enzyme that combines H2 and O2 to form water (H2O). Hydrogenase removes oxygen from the vicinity of nitrogenase in the bacterioid. Meantime, it regenerates some ATPs lost by hydrogen reduction during nitrogen reduction. Thus hydrogenase makes a suitable microenvironment for nitrogenase activity. Bacterioids synthesise ATPs, proton (H+), electron donors such as NADPH2 and ferridoxin by oxidizing the sugars. From reduced ferridoxin electrons flow to Mo-Fe-protein. 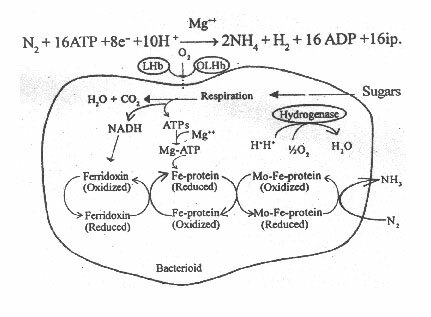 The enzyme nitrogenase complex receives energy from Mg-ATPs by hydrolysis. The Mo-Fe protein reduces N2 into NH3 by using the electrons. Atleast two electrons are required to reduce one molecule to N2 into two molecules of NH3. The Mo-Fe protein and Fe protein then separate from each other. If free H+ ions are available in large amounts, the nitrogenase reduces two H+ ions into one H2 molecule while passing the electrons from Fe- protein to Mo-Fe-protein. [For more details see-Mechanism of Nitrogen Reduction in Non-symbiotic Nitrogen Fixers]. Ammonia produced in the bacterioids diffuses into plant cells of the root nodule. NH3 is used in the biosynthesis of urides such as glutamine, glutamate and aspartate. Purines are synthesised from glutamine, and are used in the biosynthesis of allantonin and allantonic acid. These compounds are released in the xylem sap of the root. Glutamine and aspartate are converted into asparagin and is released into the root. Some non-protein amino acids such as homoserine, citrulline, canavanine, etc. are synthesised from glutamate, glutamine and aspartate, and released into the xylem sap. All these compounds are transported to various parts of the plant where they are used in cellular metabolism.